Fillings are generally the common solution to repair small damages on your teeth. In Oakland dental offices, we feel that fillings should not only serve their purpose to restore the function and strength of your teeth, but also make you feel secure about what others will see when you smile! Nobody wants an unnatural metallic smile in this day and age, so dentists have developed composite, metal-free white fillings to allow for ultimate customer satisfaction. This method not only looks natural, but feels natural as well! 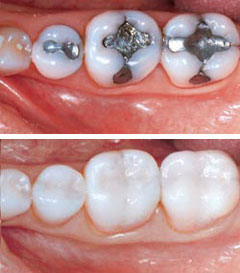 With metal fillings, the original surface of the tooth needed to be shaved down with lead to less effective teeth. Now with the composite fillings, the material can be applied directly after removing the tooth decay, and molded to recreate the cusps and ridges to allow the tooth to work as efficiently or better than before! This amazing revolution has giving confidence back to those who were self conscious about showing the imperfections of their smile. Now everyone’s smile can look naturally white and restored to look glorious! Find out more about how you can feel more confident about your smile by replacing old metal fillings with all new white fillings today!